After a twenty-five-year teaching career in special needs, Sheri has used her knowledge and experience to write her coming-of-age, young adult novel series. She connected with PAALS, (Palmetto Animal Assisted Living Services), for her research on service dogs and writes about their special abilities to change lives for the better. In turn, Sheri shares her book proceeds to support PAALS.org. Sheri enjoys visiting schools, teaching writing workshops, and speaking to adult groups about PAALS. She is writing her third novel, For Keeps. In her spare time, she reads, plays with her two dogs, listens to music, and hangs out with her husband and family. Starting Over: A Trina Ryan Novel, Volume 2 is a young adult coming of age novel written by Sheri S. Levy. While this is the second volume in the series, Levy gives sufficient background information within the story to allow it to be enjoyed as a standalone novel. Losing Sydney had been so hard for Trina, even as she recalled how well Sydney had interacted with Logan, a young autistic boy. The year she had spent training Sydney as a service dog had been an amazing experience, but returning him had taken so much resolve. As she was turning to leave the facility without him, her attention was caught by a pair of large brown eyes peering at her from the nursery. He was a baby, eight weeks old, and much younger than Sydney had been when she had begun working with him. He would be hers for eighteen months. Summer stretched out endlessly ahead of her and Colton, as she decided to name him, would be an essential part of it. They were instantly best friends, and his eagerness to learn everything she was teaching him served to reinforce her growing conviction that training dogs was what she was meant to do. 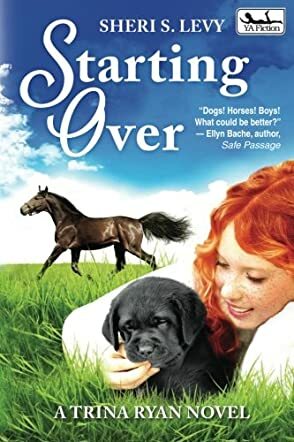 Sheri S. Levy’s young adult coming of age novel, Starting Over: A Trina Ryan Novel, Volume 2, gives the reader a privileged look at the world of guide dog training and those who put heart and soul into their work with those dogs. I loved watching as Trina teaches Colton how to become a working partner, while still allowing him to be the ebullient and eternally optimistic Labrador puppy that he was. I was also mesmerized by the parallel story about Trina’s work with horses and her interactions with the new girl, Morgan, and her horse, Knight. While this is listed as a book for young adults, I would unhesitatingly recommend it to preteens as well as any dog and horse-loving adults out there. Levy has a gift for communicating her own love of these marvelous beings to her readers, and she imparts some grand training and interaction methods to her audience while delivering a first-rate plot complete with finely drawn characters. Starting Over: A Trina Ryan Novel, Volume 2 is most highly recommended.